Snow in the San Francisco Bay area is a rare occurrence; every few years there’s a dusting at the higher elevations. With a forecasted freeze with snow levels down to 1000 feet, I planned an early morning outing to Antioch, hoping the skies would then be clear. 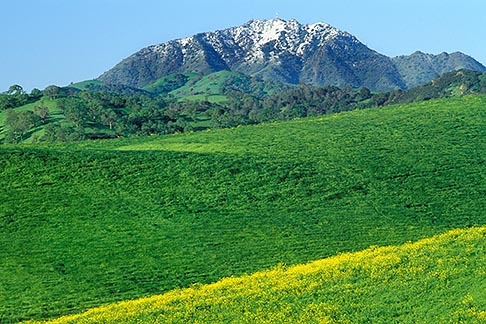 Green grass in the foreground and a scattering of Spring wildflowers provide color and contrast to the glistening snow on the peak.